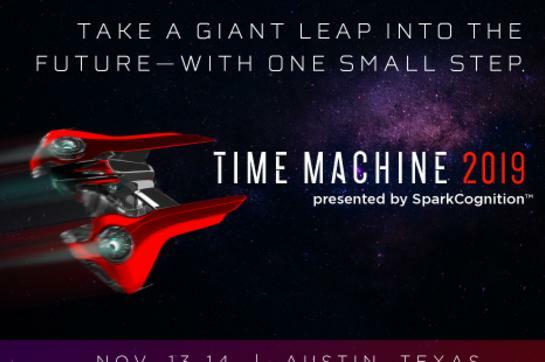 Global AI company, SparkCognition, hosts an artificial intelligence and future tech conference, Time Machine, in Austin each year. Attendees engage with real world AI applications and uncover the roadmap for their digital journey through sessions with the top executives, professors, and industry leaders from around the world. 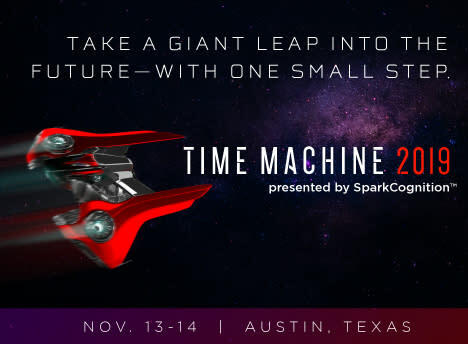 Now in our third year, Time Machine is one of the top AI and future technology events in the country. This year, we will be hosting hundreds of key decision-makers, C-level executives, top journalists, policymakers, industry leaders, and military professionals to discuss how AI and exponential technologies are being used today to shape the world of the future. Past conferences have been covered by The Washington Post and the Austin American-Statesman. In 2018, we also had Jennifer Strong, host of the WSJ’s Future of Everything podcast, conducting interviews with our speakers for her podcast. This year, we have already confirmed speakers such as John Chambers, Peter Singer, Sec. Bob Work, Dr. Clay Johnson, and Admiral Bobby Inman. Past speakers have included top executives from Boeing, Hewlett Packard Enterprise, U.S. DoD, State Street Bank, Apergy, Honeywell, GE, and many others industry stalwarts, as well as the leading minds in academia and cutting-edge research.